Sony's Wena smartwatch packs NFC in the clasp, while the LG Watch Urbane Luxe takes Android Wear to the heights of bling. Sony has unveiled an understated smartwatch with technology in the wristband itself, while LG Electronics is showing off one with a gold finish. The electronics rivals are taking different approaches, but both timepieces look more like conventional wristwatches than high-tech gizmos like the Apple Watch, which is also available with a gold finish. The Wena Wrist is Sony's latest crowdfunding project on its First Flight website, which has also gathered funds for smart locks, Internet of Things (IoT) sensors and an e-paper watch. The Wena looks fairly ordinary, with a round face, analog hands and a silver or black metallic finish. But its metal clasp contains an NFC (near field communication) module that can be used for mobile payments using Sony's contactless FeliCa standard. It can also count a user's steps and provide message notifications, in the form of vibrations or LED lights, when linked to an iPhone. Its battery lasts about a week before it needs recharging. "The Wena project team leader used to wear a traditional analog watch along with different gadgets (such as smartwatches) on his wrist, but he felt uncomfortable with the clutter this caused," Sony spokeswoman Yo Kikuchi said via email. "He dreamed of developing a device that brings together the best of both -- the beauty of an analog watch face with the convenience of digital technology." 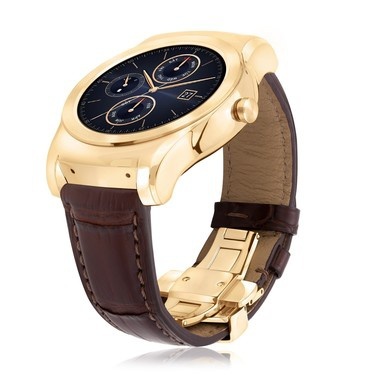 The LG Watch Urbane Luxe is decorated with 23-karat gold and will retail for about US$1,200. The Wena ranges in price from ¥34,800 to ¥69,800, with some versions already selling out on the crowdfunding site. Sony hopes to raise ¥10 million (US$82,000) for Wena and is more than halfway to that goal. The watch will be exhibited at IFA 2015, which kicks off thisweek in Berlin, and is slated to ship in Japan in April. LG, meanwhile, announced a limited-edition Android Wear smartwatch that ups the bling factor of its LG Watch Urbane unveiled earlier this year, which has identical functions. The Urbane Luxe also looks like a standard watch, albeit one with a P-OLED (plastic-organic LED) touchscreen housed in a case finished in 23-karat gold. Designed with a U.S. jewelry company, the Urbane Luxe has an alligator leather band, a built-in heart rate sensor, and a hefty price tag of $1,195. Its 410mAh battery can power it for about a day before a recharge. Customers can reserve one of the 500 units now, and they will begin shipping worldwide in October. The watch will also be shown off at IFA. "Instead of a one-size-fits-all device, LG is trying a couple different things to feel out the wearable audience, using features, design and price as points of differentiation," LG spokesman Ken Hong said via email. "Unlike some companies, we’re not looking for a mass-market device right now in wearables because we don’t think there is one."